Announced at E3, accessory manufacturer CTA Digital is teaming up with Nickelodeon to produce an interesting line of kid-friendly iPad accessories. 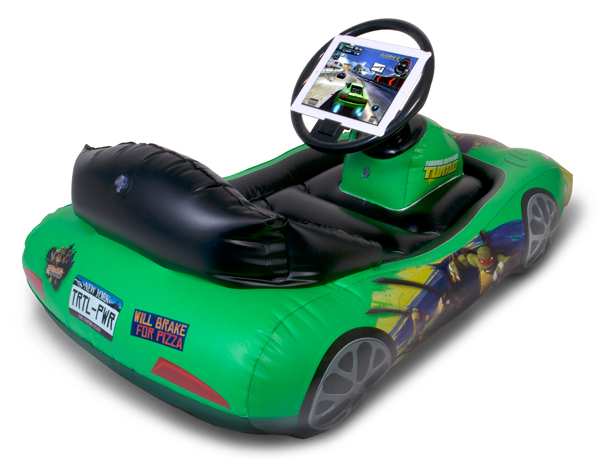 The three accessory lineup will feature characters from favorites “SpongeBob SquarePants,” “Dora the Explorer,” and the “Teenage Mutant Ninja Turtles.” The Inflatable Play Cube holds an iPad under a protective case on its recessed and padded side. It can be used upright as a viewing table or on its side like a television. The cube will come in a SpongeBob or Dora theme. Designed for babies and toddlers, the Universal Activity Tray can be attached to high chairs, car seats, and strollers. It can also be placed on the floor or tabletop with the included, foldable stand. The completely sealed and protected case will feature a SpongeBob or Dora theme. 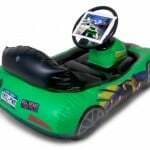 Finally, the Inflatable Sports Car has a special steering wheel mount for children to enjoy racing games and comes in all three themes. Both companies are looking to expand the line of products in the future. No prices were announced, but all three products are expected to hit the market in September. That should give me a little time to save some money, because if my kids used these, I would never get my iPad back.